The golden monkey tracking is among the prime activities in Volcanoes National Park that would flow smoothly if incorporated with Rwanda gorilla safari for any traveler visiting Rwanda. The golden monkeys are considered world over as endangered and surprisingly they are limited in range to the Virunga massif and the Giswati forest in the destination Rwanda. The countries that share the Virunga massif have gone ahead to habituate groups of these species so as to increase their value to humanity and gain reverence for their continued existence including attracting world travelers on gorilla safaris in Rwanda to spend more time in the park as they track golden monkey as an additional activity. In Volcanoes National Park, there are two (2) notable golden monkey groups with one comprising of about 80 – 100 members settling on the foothill of Mount Sabyinyo. The golden monkey trek follows more less the similar procedure as that of gorilla trekking in Rwanda. 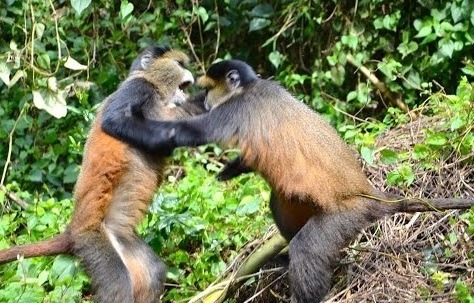 You gather at the headquarters Kinigi and involves one hour of direct viewing session with the golden monkeys. However, the departure for golden monkeys is 7am while the permit is $100 which differs with the gorilla trekking whose departure time is 8am and the permit at $750. Additionally about the variance is that the numbers to track golden monkeys are not limited unlike the gorillas which are put at only eight (8). The golden monkeys are notably active creatures that leap from tree to tree something that is really entertaining but also challenging to photograph. The visitors are usually recommended to set the cameras in a fast shutter speed that allows low light in the dense undergrowth and increase the chances of capturing the golden monkeys on the film. Golden monkey tracking is acutely the ideal way to spend an additional night in Volcanoes National Park while on gorilla trekking safari in Rwanda.